I am sure it took me longer to figure out how to post and post a picture than it took me to knit one of the socks - but I think I have it all under control - at least till next week. 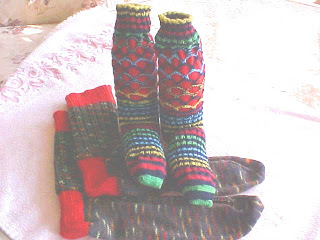 Didn't finish the two pair of socks till late last night - the races were toooo good to miss and since I have to look at what I am knitting, I just had to put the knitting down for the race. The large socks are for my SIL and they are huge. Made in the Monkey pattern (have since discovered there is another pattern called the Monkey pattern - will have to make those next) using Regia Surprise Color and Phildar. They used 150 grams (close to it anyway with only a few yards left over). The bright socks (wish I could get a picture that really shows how LOUD they are, are made from Regia Mini Ringel (color has been discontinued, wish I could get lots more of it) and the pattern is Jeanie Townsand's Michigan Cherry pattern. There is also the solid red which is Phildar Preface. They used 100 grams. This should add 250 grams and 50 points for a finish (300) to my total (at least I think that is correct - boy trying to sign into Google really has me messed up - must be my age, I use to be able to handle things like this when I was younger). I plan to send the picture to Jeanie as I am sure she never, in her wildest dreams saw her pattern looking like these socks. I love them and just hope I get up the nerve to wear them - in public!!! Wish Mark Martin had won - maybe next time. Off to start the next sock - they are SO additive. Very cool!! And what is the Monkey pattern? It might be something DH would like (if I ever get brave enough to knit socks). This Monkey pattern is a really simple (none threatening) rib and really nice to just "do" and not have to think. The first of two rows is K3, P3 and the second row is K1, P1 and you just repeat. I carry it through on the instep of the sock because I like my socks to "fit" and a plain knit doesn't do it for me. If interested in the other Monkey pattern (I collect stuffed monkey's so had to make them) I can get you the link. Haven't made them yet, but I will. If you would like any help getting you started on socks, just yell. I will warn you, I do all mine on dpn and not the new, modern way, but they are so easy, you really should give it a try. Thanks for asking about them. I LOVE those socks, both pair. The colors are so vibrant! I wish Mark Martin would have won too, but I did well with my fantasy so that's good. Haven't started it yet. The yarn I had picked out for the next pair just screamed the Tidal Wave pattern and it is turning out great so far - like it a lot - not as simple as the original Monkey pattern, but enough monkey's is enough, if you know what I mean. Made the pattern for my daughter, my SIL and me, now I have to get on with my life. The link on the other post didn't all print (I have no idea why) will try again. If it doesn't come through this time will post it to the list. those are pretty. the husband probably wouldn't wear them. but i would! thanks for sharing the link! oh--the deleted comment was me. i forgot my manners. Darn --- here I thought the deleted message was saying wonderful things about me - oh well, nice try. As for the Monkey socks - the original one would work great for your husband. You can't see it in the picture, but it is a very nice, but different rib. Makes great fitting socks - they hug the leg without being a plain rib. I'll try and get a better picture so you can see them if you want me to. There is also a blog with a picture, but know I can't get a link to print out, so I'll find it and then email you if that is OK. At least that way you can see the picture and the pattern. that would be great, sue! thanks!